RED: Palmerston North, Hawera, Christchurch, and Dunedin. GREEN: Wanganui, Wellington, and Timaru. PURPLE: New Plymouth, Hastings, Blenheim, and Oamaru. 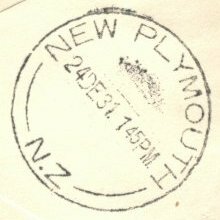 Mails from Auckland and Northern Districts were centralised at Auckland and conveyed to Palmerston North by the night express of the 23rd while mails from the Hawkes Bay and East Coast districts were flown to Palmerston North as mentioned later in this series. 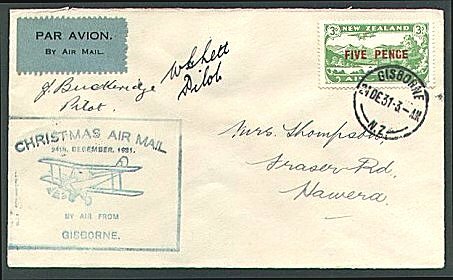 All mail for the south including that from Palmerston North left aboard a Government Moth No.872 piloted by Squadron Leader M.C. McGregor who flew to Invercargill via intermediate points. 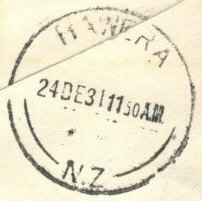 The mails from the South Island offices were centralised at Christchurch and conveyed to Wellington by the regular steamer express from Lyttelton on the night of the 23rd. These together with the Wellington mail were loaded on to a plane piloted by Flying Officer J.M. Buckeridge who flew to Palmerston North where he transferred the East Coast mails to Flight-Lieutenant W.H. Lett, who took on board the East Coast mails which had arrived with Pilot W.H. Lett and then left for Auckland via Wanganui, Hawera, and New Plymouth. These mails were included with those carried by Flight-Lieutenant Lett from the East Coast districts to Palmerston North in the Desoutter, and were then transferred to the plane flown by Flying Officer J.M. Buckeridge from Palmerston North to Auckland via Wanganui, Hawera and New Plymouth. 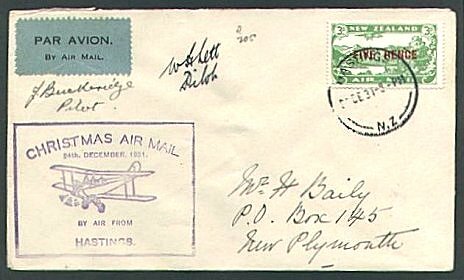 This mail was carried from Wellington to Palmerston North in the plane piloted by Flying Officer J.M. Buckeridge, and there transferred to the Desoutter Monoplane piloted by Flight-Lieutenant W.H. Lett to Hastings and Gisborne. (flown from Wellington-Palmerston North by Flying Officer J.M. Buckeridge where the East Coast mails were transferred to Flight lieutenant W.H. Lett and the mail from the East Coast was taken on board. (flown by Flight lieutenant W.H. Lett in Desoutter. ZK-ABY). 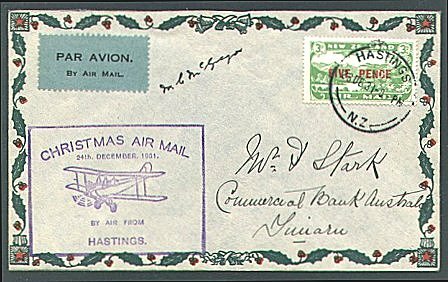 Following on the success of the 1931 Christmas Air Mail Flights through out New Zealand, the Postal Authorities decided to conduct a similar series of flights and the same routes were chosen as in the previous year. The flights were again arranged by the N.Z. Air League with the co-operation of the N.Z. Post Office. A special pictorial cachet was applied at the appointed Post Offices using selected coloured ink. 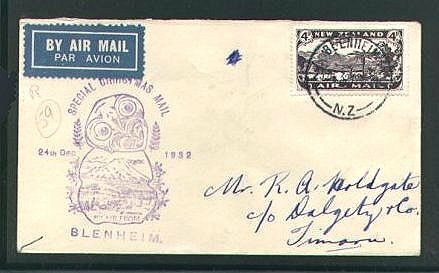 Some letters which missed the cachet initially were later stamped with the incorrect cachet. The same air mail fee was charged [namely 3d per ounce] but because, in the meantime the ordinary postage had been reduced from 2d to 1d. The overall charge amounted to only 4d for letters not exceeding one ounce. 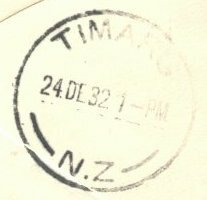 On this occasion the Postal Department departed somewhat from the stereotype designs of their previous cachets by introducing the Maori "tiki" as the central motif of the 1932 cachets. The lower portion of the "tiki" incorporated a view of a biplane flying near Mt. Egmont and this in turn was flanked by fern leaves and sprays of clematis. The colours of the rubber-stamp cachets were as follows:- Blenheim and Palmerston North [purple], Christchurch, Oamaru, Dunedin, Gisborne, and Wanganui, [red], Hawera, Hastings, and Wellington [green], Timaru [yellow-green], and New Plymouth [violet]. 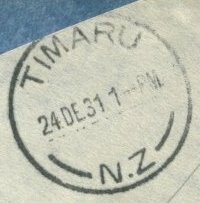 Most mail was backstamped with the exception of that to New Plymouth, and from Gisborne to Hastings, Palmerston North, Auckland which, in most cases, was not backstamped. Squadron Leader M.C. McGregor was to have flown the main route; Palmerston North - Invercargill but through an aircraft accident was in hospital at the time and his place was taken by Flying-Officer J.M. Buckeridge who flew a D.H. 60M Moth ZK-ACD, leaving Palmerston North at 7.38am and arriving at Invercargill at 3.55pm. 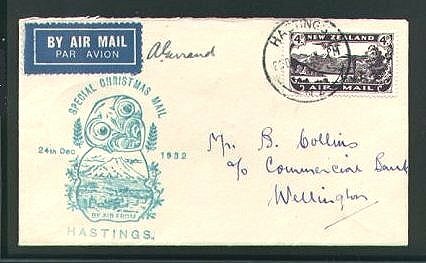 As with the 1931 flight, mails from the South Island were forwarded to Wellington by ferry steamer and connected there with the air mail flight which left Wellington at 8.04am and arrived at Auckland at 1.50pm. From Wellington to Palmerston North the pilot was S/L G. Stedman of the Wellington Aero Club whilst pilot R. Kirkup of the Auckland Aero Club flew the mails from Palmerston North to Auckland. These flights were undertaken by Mr. A.G. Gerrand, who was at that time pilot-instructor to the Hawkes Bay and East Coast Aero Club based in Hastings. The plane left Gisborne at 4.00am and arrived at Palmerston North at 6.20am leaving Palmerston North again at 9.22am and arrived at Gisborne at 12.05pm. Mails over these sections were conveyed from Gisborne to Palmerston North by Mr. A.G. Gerrand and then transferred to the DH Moth flown from Palmerston North to Invercargill by F/O J.M. Buckeridge. These mails were included with those flown by Mr. A.G. Gerrand from the East Coast districts to Palmerston North and then transferred to the plane flown by pilot R. Kirkup of the Auckland Aero Club, from Palmerston North to Auckland, arriving at Mangere Aerodrome at 1.50pm. 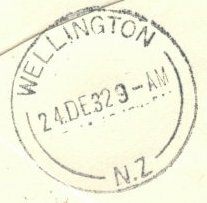 This mail was carried from Wellington to Palmerston North by S/L G. Stedman of the Wellington Aero Club and was then transferred to the plane piloted by Mr. A.G. Gerrand from Palmerston North to Hastings and Gisborne.